Wonderful is right as it shows how things can quickly change in our world. You are about to read the story of Neville. 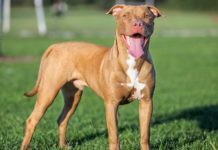 A story of how a dog that was “dangerous” according to Canadian Breed Specific Legislation went from almost being put down to bomb detection dog here in the United States of America. 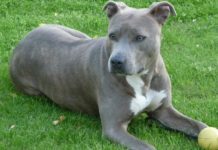 Canada in their great wisdom passed a BSL law in Ontario banning American Pit Bull Terriers. This law put Neville in danger. Gerogina shelter in Ontario is where Neville was placed. After the word spread about Neville he found a place to live. However, the 2500 transport needed wasn’t working as planned and he was left to wait and possible be put down as rescue’s and volunteers worked frantically to arrange for his transport. When things were at their most desperate, when everyone involved was about to throw in the towel, a person stepped up and offered to fly Neville (and another dog Nitro) to the US. Neville settled in for the long wait as a foster dog with his foster Mom. Much to her delight he was not underweight but in great shape and he was well trained. 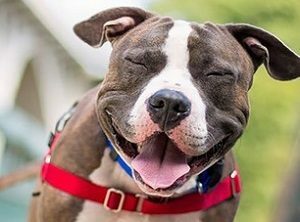 If every rescue APBT came like this we would have so much more success adopting them out! 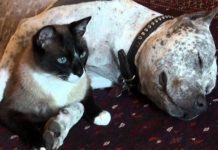 Neville was tossing out surprise after surprise to his foster mom and this is where Neville’s story takes a turn. Diane Jessup has an awesome program called, Law Dogs. 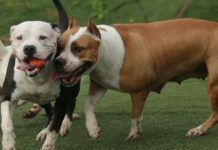 Law Dogs is a program to find homeless APBT’s and other bullies and test them for police work as detection dogs for drugs and bombs. Nevilles foster mom was encouraged to contact Diane and see if she would take a look at Neville because Diane was searching for bomb sniffing candidates for the Washington State Patrol detection dog program. Well, much to her surprise Diane contacted her quickly and after some scheduling Diane arrived at Neville’s home to test him out. Diane’s contact at the State Patrol evaluated Neville and was very pleased with him. He tried to contact his superior but he couldn’t get a hold of him so Neville went home with Diane for more waiting. I don’t know, it seems to me that Neville should get a medal just for the waiting part! After a stay with Diane the officer had contacted her and Neville had to pass one more test before he could be accepted into the detection dog program. Finally, after a long 24 hour wait word came that Neville had passed his final test with flying colors and he was accepted into the State Patrols program. Neville immediately went into training and also graduated. Imagine that for a moment. 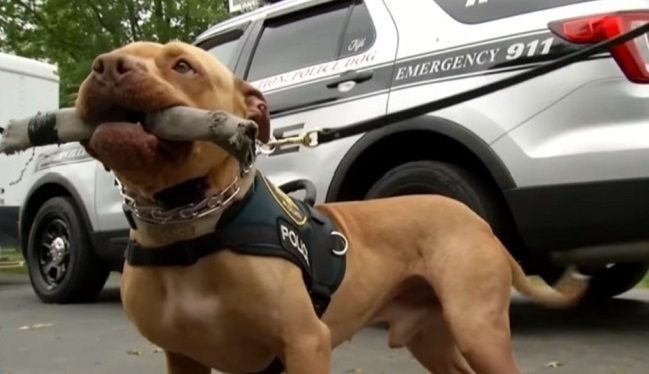 From a dog scheduled to be put to sleep simply for being a Pit Bull to Officer Neville of the Washington State Patrol in 5 months. Today Officer Neville screens over 200 cars a day on the Washington State Ferry system to help keep us safe from bombs. I am getting chills as I write this story because it’s so exciting! Not to mention it is a shot in the arm for breed relations and the value of a rescue dog as an option besides buying from an expensive breeder. Pay close attention to Neville’s story. People paid lots of money, spent hundreds of hours of their personal time, all for a dog they didn’t even know. They deserve our gratitude and respect for their undying compassion in the face of a law that is foolish at best. Do you have a rescue dog? Do you think they might make a great Law Dog? I can’t say enough about Diane Jessup’s Law Dog program. 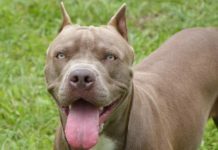 Not only is this program going to save the lives of Pit Bulls and other bullies in need, it is going to help keep us safe too. Bomb and drug dogs are in great demand. Departments spend upwards of $12,000 per dog and their resources are limited. Law Dogs is a great program that gives back to society in a big way. 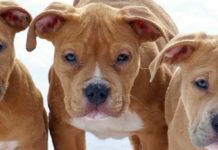 Even though society is constantly trying to take our rights and our dogs from us, the Law Dogs Program is essential for helping restore the honor our dogs deserve.